One of the most requested features to our kdb+ Grafana adaptor was the ability to create panels from the results of server side functions. 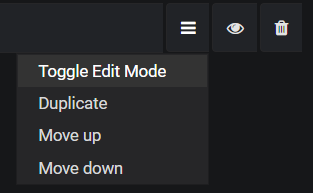 This most recent update to the adaptor continues to build on the SimpleJSON datasource created by Grafana by working around the limitation of the single drop down menu for queries, whilst also allowing parameters to be supplied. The adaptor is also integrated into TorQ as a whole, meaning this update will be available to any TorQ process. Function calls can be typed directly into the query box; by adding the prefix “f” followed by the server’s chosen delimiter character (“.” by default) to the function call, the function will be executed, and if the result is a table, it can be manipulated in the same way as in-memory tables for both the table and time-series response options. Functions which do not return a table will return an error if an attempt to use them is made. The format for time-series requests for functions is “f.type.functioname[params]”, where “type” refers to the current panel. 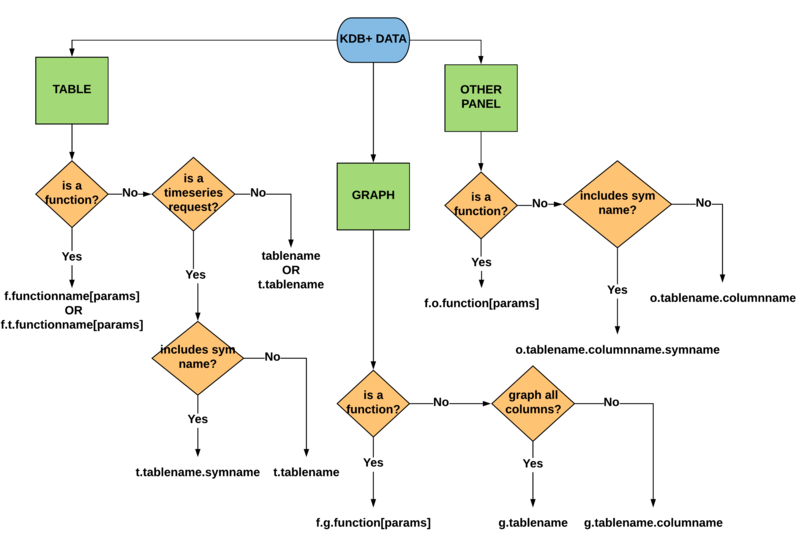 As with in-memory queries, the appropriate character for each panel type must also be supplied, namely “t” for table panels, “g” for graph panels, or “o” for other panel types, such as heat-maps; this is to workaround the fact that information on the panel type, and therefore what format the data must be returned in, is not included in Grafana’s JSON request to the server. The update works by checking for the “f” prefix before the query string is parsed. If so, everything after the first instance of the user defined delimiter is executed; if a time-series request is made, the panel type character is split and collected in a similar way, so the result of the function can be sent to the correct handler. This way, parameters containing the delimiter will not be separated from the full function call, e.g floating point numbers. Otherwise, the arguments for querying an in-memory table are parsed as normal, splitting the string by each occurrence of the delimiter. An important addition since the initial adaptor update is the ability to read data directly from a HDB running on a TorQ process into Grafana. This can be done by simply setting the URL of your SimpleJSON datasource to the IP address of your server followed by the port your HDB is running on. Before querying your HDB, ensure your time-series range is setup correctly and that you select only the required columns; selecting too wide a range may result in crashing your HDB. One small change has been made for usability: previously, if you selected “t.trades” or “t.trades.MSFT” for your query in a table panel, this would only work if you had also selected “timeserie” from the response dropdown; now, if you select table, this will create a table as expected, the key difference being that the Grafana time range option will not be applied. Although it was possible to implement this feature within the constraints imposed by the SimpleJSON datasource, it has also exposed the adaptor’s limitations: graphs and heat-maps for non-time-series data are unable to be created from either functions or in-memory tables, and the query syntax required to return data in the correct format becomes cumbersome when working with other namespaces. AquaQ Analytics are now researching a replacement for this adaptor, which would allow for a more generalised approach to visualisation of kdb+ data, greater flexibility for queries, and provide a more user-friendly interface for supplying parameters to functions which would not require knowledge of q syntax.